Email: iaai@firearson.com if you have any questions. The Awards Committee is seeking nominations for the awards listed below, which customarily are presented at the annual meeting by the Association. Investigator of the Year Award is given to an individual who has shown outstanding achievement through the use of professional expertise in both the criminal and civil fields of arson control. The recipient shall not be a current officer or member of the Board of Directors, nor shall the recipient be a member of the Awards Committee. There shall be one annual Investigator of the Year. In addition to the aforementioned awards, the Association presents Certificates of Appreciation annually to selected individuals who have provided or performed services considered to be in the best interest of the Association. Awards will be given in the categories of Arson and Accidental Fire Photography. First and Second place and Honorable Mention awards are presented for each category. Photos will be judged on the quality and content of the cause represented, technique and composition of how well it depicts its category. In addition, photographs will be published in the Fire & Arson Investigator journal. The photographic award competition is open only to members in good standing of the IAAI. All photos entered must be the work of the person entering and must have been taken within the preceding 48 months. The following information must be placed with the description for each photo submitted: name, mailing address, telephone number, department or company name, date photo was taken, location of photo scene, number sequence of each photo submitted by digital number as described in Rule 5 and current email address. All photo entries become the property of the IAAI and will not be returned. Any entry not complying with these rules will be eliminated. 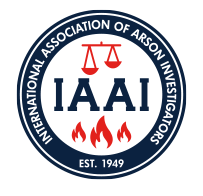 All photos must be submitted via email to iaai-photos@firearson.com no later than February 15th of each year.